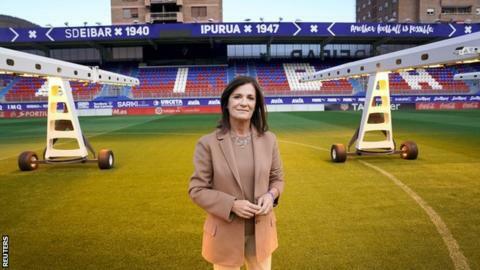 The top two management positions at La Liga’s smallest club Eibar are held by women. President Amaia Gorostiza admits it’s “unusual”, but also says its “nothing special” in this small Basque city. Gorostiza played a lead role in the recent Amazon documentary Six Dreams, which gave a behind-the-scenes look at La Liga. It introduced her and Eibar to a wider audience who have enjoyed her uniquely close relationship with her players… and her lucky shoes superstition. On Saturday, Eibar beat 13-time European champions Real Madrid for the first time, triumphing 3-0 at the 7,083-seater Ipurua stadium. Gorostiza celebrated the victory, like she does every other win, with the players in the dressing room. But this one was extra special. Gorostiza was videoed spraying champagne, later declaring it a “holiday for everyone”. “A historic victory, a dream that we knew one day we could achieve,” she said. Eibar were punching well above their weight against Real’s Galacticos. Situated in a town of just 27,000, sitting in a valley in northern Spain, the club is the smallest competing in the top five leagues in Europe. Off the pitch, the club is run by Gorostiza and Patricia Rodriguez, the only female chief executive in Spain’s top flight. “For us it [being female] is something natural and we do not give it more importance,” says Gorostiza. “It is being given more importance from the outside, I recognised the first time some presidents looked at me a little bit strange but if you act like it is natural then it will be. Speaking to BBC Sport, Gorostiza explains the club’s philosophy, their motto ‘another football is possible’, the “family” of Eibar, and her superstitions. Eibar were promoted to La Liga for the first time in 2015, and last season achieved their highest league position ever, finishing ninth. As Gorostiza is keen to point out, that was ahead of their much bigger Basque rivals Athletic Bilbao, Alaves and Real Sociedad. Gorostiza’s close relationship with the players and manager Jose Luis Mendilibar was evident in the Amazon show. In one scene she jokes about left-back David Junca’s haircut, in another she comforts Dani Garcia as the captain tearfully announces he is leaving. “Perhaps the biggest difference compared to other clubs is the closeness between everyone,” says the 51-year-old, who became president in 2016. “From the members of the council to the cooks or cleaners, including the entire technical team, the players’ staff and the administrative employees, we have a very close relationship. “They [the players] are very young people, most of them left their families very early and they come here and find a big family. We live like a family, we have lunch together most days. She adds: “Of course they earn money and that’s important for them. Most of them have offers from other clubs, but they prefer to come here to start growing up and to be comfortable. And if they leave the club, they continue with the values of Eibar. Gorostiza says Mendilibar, who is from the nearby town of Zaldibar, is in demand from rivals, but she hopes he will stay “for a long time”. In the documentary, Gorostiza is shown missing Eibar’s opening goal in their 4-1 win against Girona last season because she was putting on her “lucky” shoes. She tells the players she will not change them until the end of the season. The superstition began when she wore yellow shoes for a 1-1 draw at the Bernabeu in October 2016. “The players asked me for the rest of the season to wear yellow shoes,” she says. “Last season it was another colour and this season it’s another. I think they are working. “Our aim is to be in the first division for as much time as possible and be prepared if we go down to the second division, that we can get back up again,” says Gorostiza. One way they hope to continue their La Liga stay is by developing their own training facility, as they rent their current one. Eibar are debt free and try to buy second-division players, to whom they can add value. They also want to expand into other foreign markets. Japan winger Takashi Inui helped them become the third biggest team in his country last season, before he left for Real Betis in June. A breakaway Super League by Europe’s top clubs was dismissed by two of the continent’s most influential football officials last week. Gorostiza says such a league would be “difficult” for Eibar, but they would “fight it”.